Special Event at The Fresh Market! My local partner in all love of food, The Fresh Market, is sponsoring avery exciting conference in Greensboro! We are so lucky to have the headquarters of the corporation here in our hometown — and even more lucky that they are so generous to the community. The Atlantic World Foodways 2014 Conference is in Greensboro and partnering with UNCG, Quaintance Weaver and the The Fresh Market. 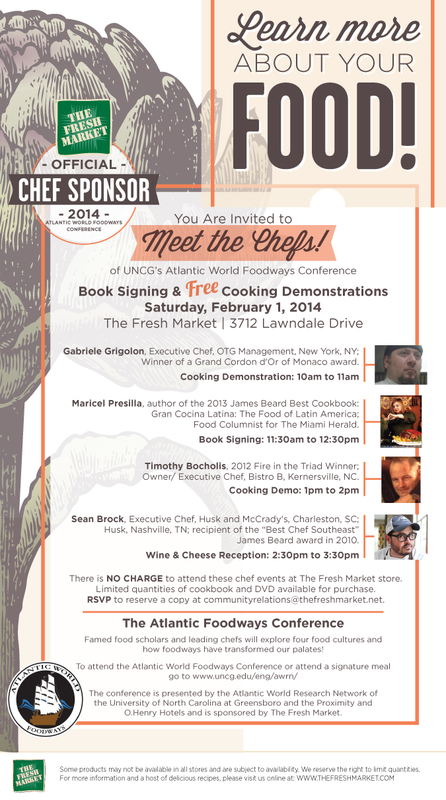 They are bringing some super stars in the food scene to Greensboro and you can meet them! And learn and dine throughout the week! I am personally looking forward to meeting Sean Brock of Husk in Charleston. Check out all the opportunities below. Maybe I will see you Saturday at the wine & cheese event at The Fresh Market?!? Previous A stop by Savory Spice Shop!